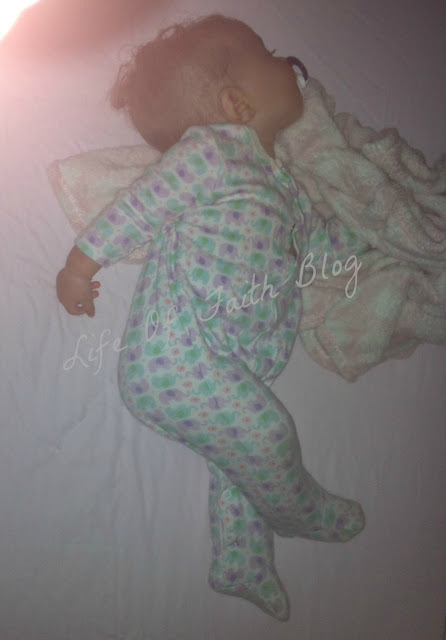 The Life Of Faith: Sweet Pea s 8 months old! 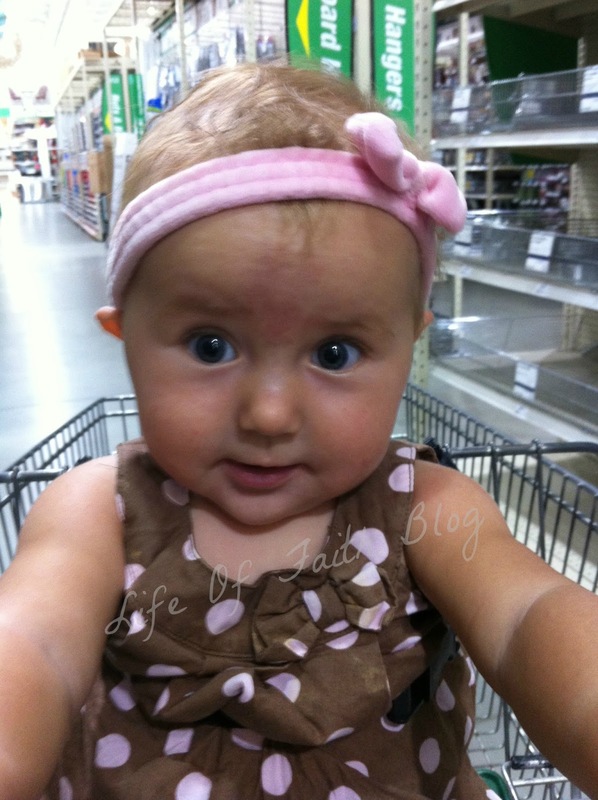 Well it finally happened...mommyhood caught up with me and I'm over a week late on sweet pea's 8 month update! I didn't forget, it was just moving week last week. Enough said! But here we are, a little late but just as cute! 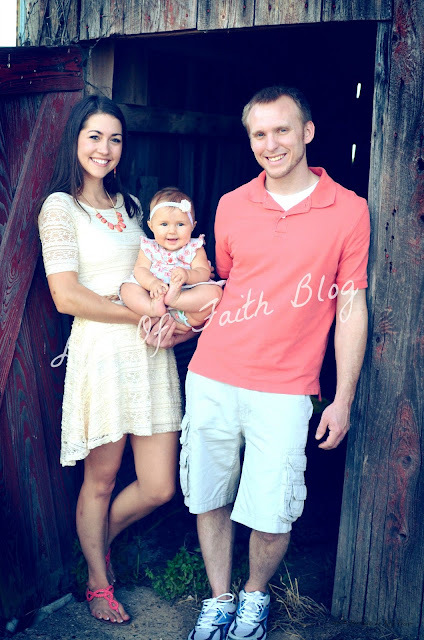 This month was very challenging as we were working so hard to get our house ready. I had to drop you off with babysitters more often than I would have like just to get painting and other work done at the house. I feel like I've missed out on a lot this month but I'm looking forward to making up for it this coming month! Milestones: You are doing great at pulling yourself up on things. I'm trying not to rush you on walking though, because from what I've read, the longer you crawl, the better! You look adorable balancing on those chubby legs though! And you are just at the stage where you are getting into EVERYTHING! You have really started to interact while reading books lately. You love to turn the pages and feel each page. You sometimes even squeal in response to seeing something you like. You especially love books that have mirrors in them! You love seeing your reflection in mirrors! You learned to blow kisses just a few weeks ago! Now you blow them to everyone you see. It's SO cute! This month we have noticed your personality developing so much more. The expressions, gestures, and sounds you make are so much fun as you do your best to interact with us. It has also become clear that you know what you want, when you want it and how you want it, that's for sure! Eating: You have been doing great with solids. You have had so many new foods it's hard to remember them all. You still breastfeed every 4 hours which is still your main source of nutrition. I'm hoping to keep it that way till you are at least one. For now, food is just fun. I have started giving you more chunks of food on your highchair tray. 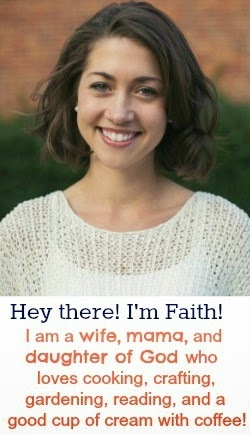 You prefer that over being spoon fed. It's fun watching you eat on your own and chew up the soft pieces of broccoli, zucchini, peaches and more! 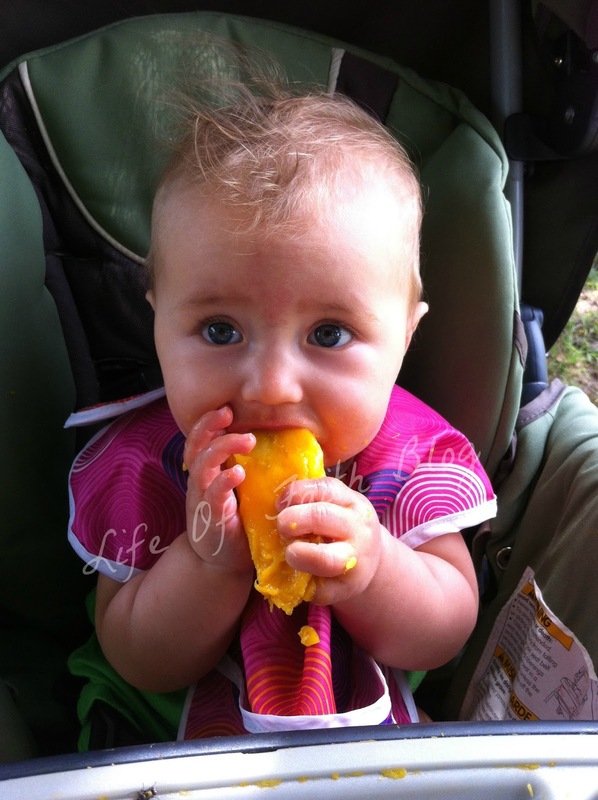 Here you are with your favorite...a mango! You also love the little baby food pouches. I finally bought the kit to make them myself since I prefer making your food rather than buying it! Your new favorite food that I gave you this month is egg yolks. I was nervous to try it, but you love it! I just fry or boil an egg and then cut it up into little pieces for you to eat. Teething: I think teething could be a curse word...it's no fun for either of us! You have 2 cute little teeth on the bottom and are working on those top ones now! I have a healthy fear of your teeth...those things are wicked sharp! See those suckers? This was the first photo I took of you where I noticed how grown up you are becoming. 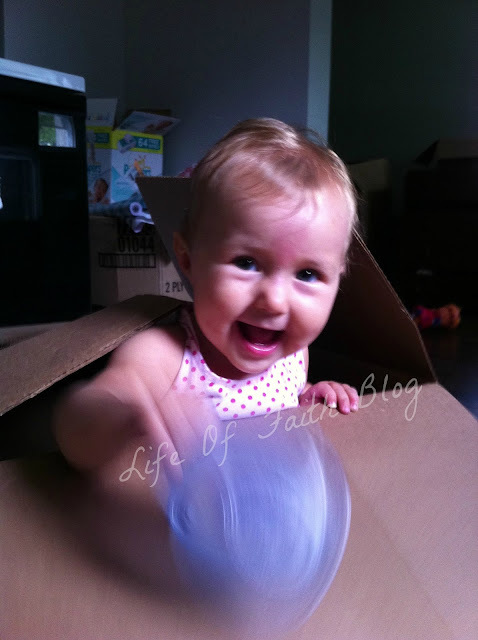 You are losing that baby look already (tear)! Sleeping: When you are teething, you are up 4-5 times a night and sometimes just cry until you fall back to sleep. I know it's rough poor baby. When you aren't teething, you usually sleep about 10 hours a night and get up 1-2 times to eat. You take a nap at 10 and 2 and sometimes again around 5. I love the different positions you end up in while you sleep. I can't help but take pictures of you! When you are trying to fall asleep you always have to stroke something whether it's your bed sheets or your blanket. It's sweet to see your little hand opening and closing. You also make a cute little sigh noise while you are falling asleep. Sometimes you do it so much, it sounds like you are humming. 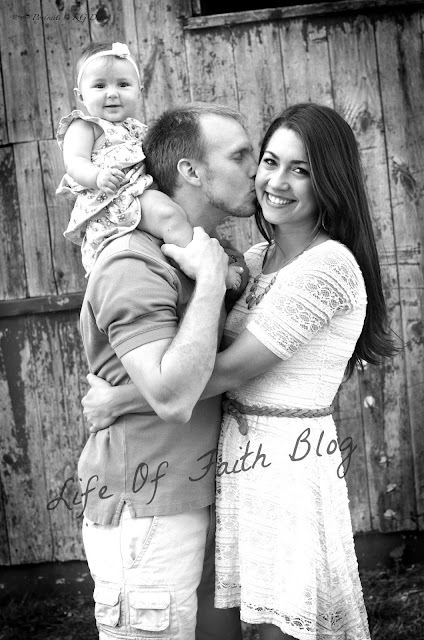 Memories: We had family photos taken by our sweet friend Keren. We also had lunch with dad a few days. You are finally seeing more of him now that we are living in our new house! 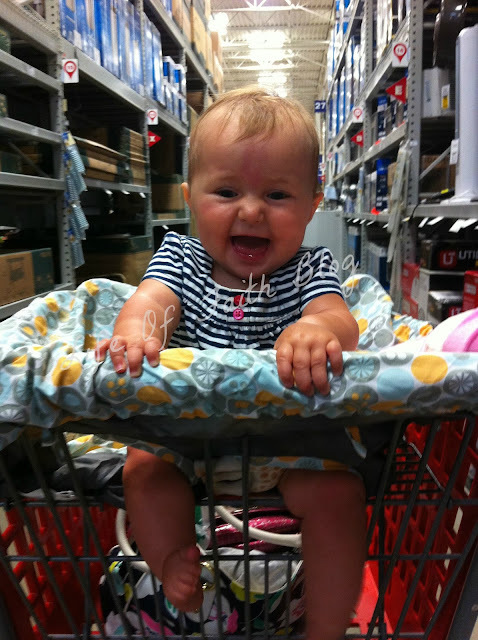 You have a blast every time we go shopping with you now that you can sit in the front of the cart. You also blow kisses and wave at everyone we pass. You are a little sunshine! We went to family fun day at the Zoo where you saw bubbles for the first time. You were intrigued! You also went to your first baseball game this month. Woohoo! Looking Forward To: I'm still waiting to hear you say mama. You know that's who I am, but you haven't learned how to make the "m" sound yet. It won't be long though! she's adorbs!! 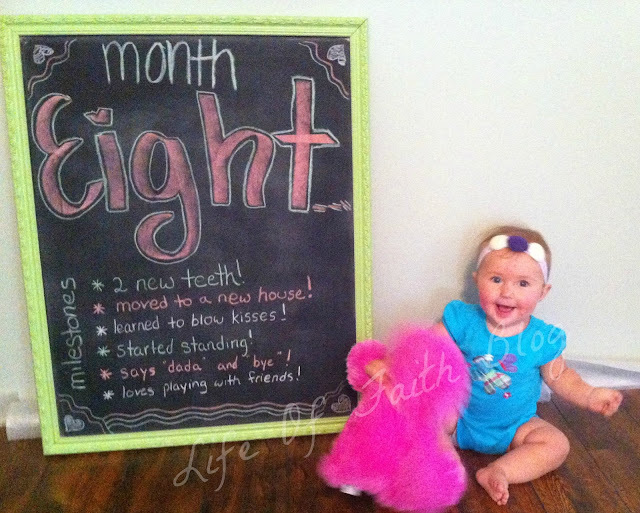 canot believe she is 8 months already! Hi you are so blessed. 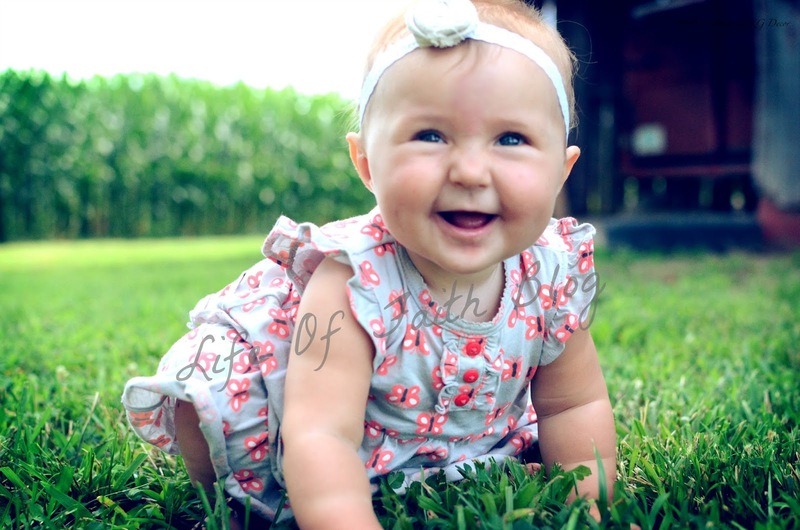 Your little girl has the most beautiful smile. 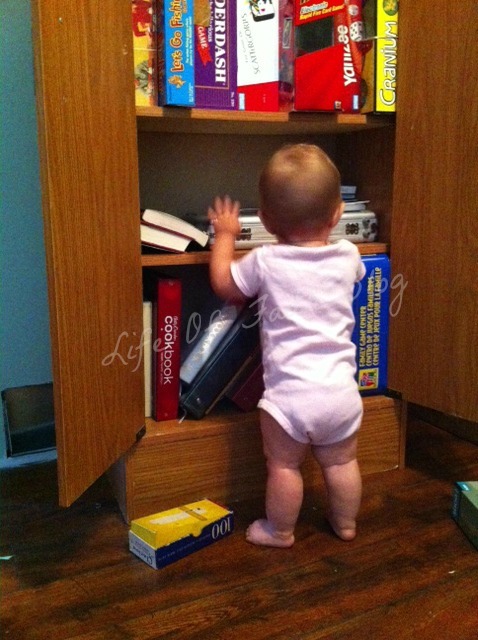 :) I so enjoyed reading about her at eight months. She is so cute! That was one of my favorite ages with my daughter. They are so interactive and fun, but not too sassy yet! Faith I am just getting caught up on your blog and my word have you been blessed and busy! New house with a little one ha! Congrats on all the blessings!